Currently quoting for a Loft Conversion in both Bournemouth and Weymouth. Second fix in Poole. Timber garden building in Southampton. Howard Johnson Carpenters and Joiners now taking on work for 2016. New cut roof in Bournemouth. Roof is re-pitched over the existing to allow space for a new bedroom and bathroom in the attic. By retaining the existing the cost of a scaffold over-roof was avoided. 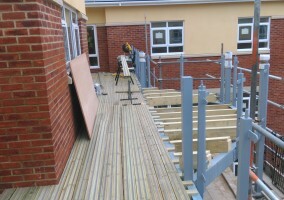 Decking to two suspended levels enabling residence of a new care home to enjoy country views. Job undertaken on a sub-contracting basis. Complex housing to staircase newels at our Sub – Contract project in Surrey.